During his trip to Africa at the end of June, President Obama announced the Power Africa initiative. The press release highlighted several goals, including adding generation capacity in the six target countries, which include Kenya, and increasing the number of households and businesses with access to electricity by at least 20 million. I was recently in Kenya meeting with potential partners for a research project that will measure rural households’ demand for grid connections, as well as the social and economic benefits of bringing people electricity. (The project is joint with Professors Ted Miguel and Eric Brewer and funded, in part, by USAID’s new Higher Education Solutions Network (HESN).) I gained several insights on the opportunities for growth in the local power sector as well as the challenges to bringing power to more Kenyans. Let me start with a couple facts. The total electric generating capacity in Kenya is about 1,700 MW. By comparison, the generating capacity in California, where population is 40 million compared to Kenya’s 45 million, is 70,000 MW. Kenya has plans to add substantial capacity in the near future, including several large geothermal projects. On the distribution side, the Rural Electrification Authority in Kenya has made tremendous strides over the past six years building out the low-voltage distribution network. 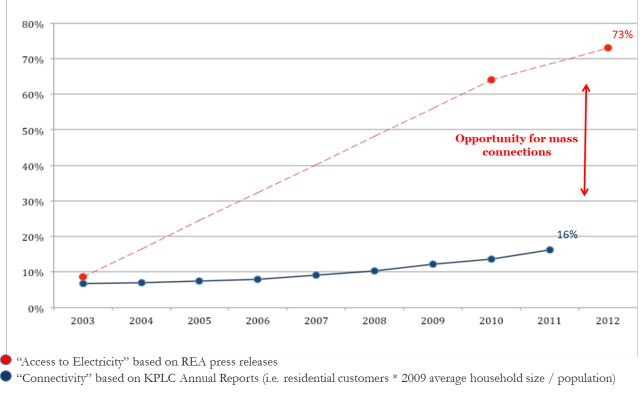 Nationwide, more than three-quarters of the Kenyan people now live within 1.2 km of the grid. We visited a regional office for the agency and saw rows and rows of transformers, waiting to be installed, so this share will likely grow even higher in the future. Kenya Power Company, which operates the distribution system nationwide, will connect a household to the grid as long as it’s within 600 meters of a transformer, so many households are within striking distance. Here’s the catch, though. The household has to pay about $400 to KPC for the connection, and there is talk that the company plans to increase the connection charge to almost $900 this summer. In a country where the per capita income is around $800, most households are priced out of a connection. As a result, roughly 20 percent of the population actually has electricity in their homes. More than half of the people in the country are living under the grid without access to it. I met with a grandfatherly gentleman I’ll call Mr. X in Kisumu rural, close to Lake Victoria. His house, on a steep hill overlooking a picturesque valley, is about 100 meters downhill from a secondary school that began receiving electricity 3 years ago. He quietly answered questions about his living situation and smiled patiently at my attempts to thank him in Swahili (“asante sana”). Mr. X became animated when the conversation turned to “stima” or electricity. He was indignant that the nearby school had electricity but he did not. When probed, he told us that the only reason he did not have power was the large connection charge – he could pay for the wiring in his home and afford the monthly payments. Without electricity, Mr. X spends about $7 per week buying kerosene that he uses to cook and power a large, pressured kerosene lamp that lights his whole house. Plus, to buy kerosene each week, he must pay about $1.25 for a motor scooter ride to the nearest village, about 5 km away. When probed about what he would most like to do if he got electricity, he mentioned cooking and lighting his home, so it’s likely that his kerosene costs would decline significantly with a connection. He also wanted to iron his clothes and operate a welder, the latter of which could potentially bring him more income. Access to electricity has the potential to transform many lives – creating income-generating opportunities, allowing children to study later at night and replacing expensive, time-consuming and polluting alternatives such as kerosene. As energy economists, we have many opportunities to learn about the benefits of electricity as well as the best business and policy models to use to increase access. 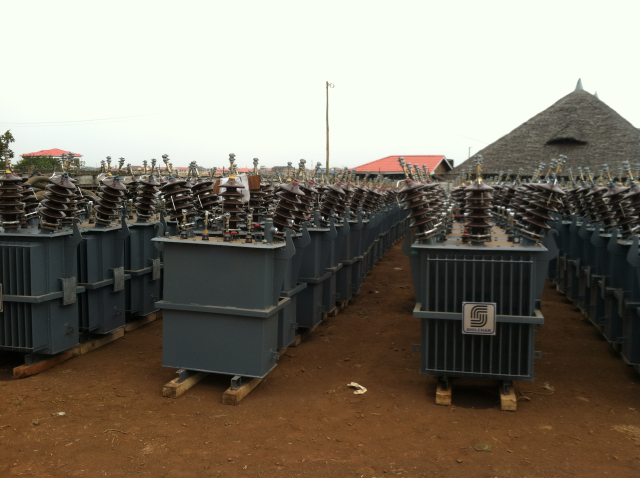 Programs like Power Africa can be hugely impactful, so we need to make sure we do them right. About the author: Catherine Wolfram is an Associate Professor of Business Administration at the UC Berekeley Haas School of Business and co-director of the Energy Institute at Haas. Wolfram has published extensively on the economics of energy markets. She has studied the electricity industry around the world and has analyzed the effects of environmental regulation, including climate change mitigation policies, on the energy sector. She is currently implementing several randomized control trials to evaluate energy efficiency programs. This blog was also published with the Energy Collective and the Energy Economics Exchange of the Energy Institute at Haas. And for those who love green jelly beans and are prone to acne: it’s probably safe to keep eating them in large quantities. On Thursday, April 25th, CEGA will host its fourth annual research symposium, Evidence to Action: Promoting Global Development in a Changing Climate, together with the Abdul Latif Jameel Poverty Action Lab (J-PAL) and the Energy Institute at Haas. This year’s program will explore the critical nexus of economic development and climate change. The challenges are complex: global temperature changes can exacerbate food insecurity and human conflict, undermining economic growth in less developed countries. At the same time, poverty reduction is rapidly increasing the demand for energy, which promises to accelerate carbon emissions and environmental pollution. How do we address the tensions between climate, environment, and global development? There is too little evidence regarding the various policy and technological solutions to climate change. Our affiliates are working to change that. Presentations will highlight a series of experiments revealing what works in terms of climate change adaptation and mitigation, what doesn’t work, and why. Rigorous impact evaluations like these are bolstering the knowledge base and – as we will see on April 25th – generating evidence that is transforming public policy. Tackling climate change in low-income countries is not a job for academics, policymakers, or the private sector alone. Rather, a synergistic approach is needed to understand the issues and address the challenges facing individuals, communities, industries, and governments. This year’s symposium will build a foundation for future research and policy action in this area. The symposium is free and open to the public. Please share your thoughts on the event by commenting on this post. Register here!! Evidence to Action (E2A) is CEGA’s annual research symposium. Every year, E2A highlights a pressing issue related to global poverty, and showcases the potential of rigorous research to inform better policy-making in developing countries. Past E2A’s include the Road from Conflict to Recovery (2012), the Returns to Investment in Girls (2011), and Global Health and Education (2010). CEGA is hosting a series of opinion pieces by leading scholars, all addressing issues of transparency in empirical social sciences. CLICK HERE to read and comment. There has been a flurry of activity regarding research transparency in recent years, within the academy and among research funders, driven by a recognition that too many influential research findings are fragile at best, if not entirely spurious or even fraudulent. But the increasingly heated debates on these critical issues have until now been “siloed” within individual academic disciplines, limiting their synergy and broader impacts. The December meeting (see presentations and discussions) drove home the point that there is a remarkable degree of commonality in the interests, goals and challenges facing scholars across the social science disciplines. This inaugural CEGA Blog Forum aims to bring the fascinating conversations that took place at the Berkeley meeting to a wider audience, and to spark a public dialogue on these critical issues with the goal of clarifying the most productive ways forward. This is an especially timely debate, given: the American Economic Association’s formal decision in 2012 to establish an online registry for experimental studies; the new “design registry” established by the Experiments in Governance and Politics, or EGAP, group; serious discussion about a similar registry in the American Political Science Association’s Experimental Research section; and the emergence of the Open Science Framework, developed by psychologists, as a plausible platform for registering pre-analysis plans and documenting other aspects of the research process. Yet there remains limited consensus regarding how exactly study registration will work in practice, and about the norms that could or should emerge around it. For example, is it possible – or even desirable – for all empirical social science studies to be registered? When and how should study registration be considered by funders and journals? Not long ago, I attended a talk at which the presenter described the results of a large, well-crafted experiment. His results indicated that the average treatment effect was close to zero, with a small standard error. Later in the talk, however, the speaker revealed that when he partitioned the data into subgroups (men and women), the findings became “more interesting.” Evidently, the treatment interacts significantly with gender. The treatment has positive effects on men and negative effects on women. A bit skeptical, I raised my hand to ask whether this treatment-by-covariate interaction had been anticipated by a planning document prior to the launch of the experiment. The author said that it had. The reported interaction now seemed quite convincing. Impressed both by the results and the prescient planning document, I exclaimed “Really?” The author replied, “No, not really.” The audience chuckled, and the speaker moved on. The reported interaction again struck me as rather unconvincing. Why did the credibility of this experimental finding hinge on pre-registration? Let’s take a step back and use Bayes’ Rule to analyze the process by which prior beliefs were updated in light of new evidence. In order to keep the algebra to a bare minimum, consider a stylized example that makes use of Bayes’ Rule in its simplest form. I am sold on the idea of research registration. Two things convinced me. First I have been teaching courses in which each week we try to replicate prominent results produced by political scientists and economists working on the political economy of development. I advise against doing this because it is very depressing. In many cases data is not available or results cannot be replicated even when it is. But even when results can be replicated, they often turn out to be extremely fragile. Look at them sideways and they fall over. The canon is a lot more delicate than it lets on. Second I have tried out registration for myself. That was also depressing, this time because of what I learned about how I usually work. Before doing the real analysis on data from a big field experiment on development aid in Congo, we (Raul Sanchez de la Sierra, Peter van der Windt and I) wrote up a “mock report” using fake data on our outcome variables. Doing this forced us to make myriad decisions about how to do our analysis without the benefits of seeing how the analyses would play out. We did this partly for political reasons: a lot of people had a lot invested in this study and if they had different ideas about what constituted evidence, we wanted to know that upfront and not after the results came in. But what really surprised us was how hard it was to do it. I found that not having access to the results made it all the more obvious how much I am used to drawing on them when crafting analyses and writing; for simple decisions such as which exact measure to use for a given concept, which analyses to deepen, and which results to emphasize. More broadly that’s how our discipline works: the most important peer feedback we receive, from reviewers or in talks, generally comes after our main analyses are complete and after our peers are exposed to the patterns in the data. For some purposes that’s fine, but it is not hard to see how it could produce just the kind of fragility I was seeing in published work. These experiences convinced me that our current system is flawed. Registration offers one possible solution. The views expressed in this blog are those of the authors, and do not necessarily represent the views of any individuals cited or the Center for Effective Global Action. All errors are our own. The official website for CEGA can be found at cega.berkeley.edu.